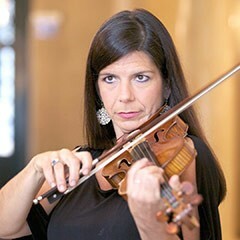 Renowned violinist Pamela Frank has established an outstanding international reputation across an unusually varied range of performing activity. As a soloist, she has performed with leading orchestras including the New York Philharmonic, the Chicago Symphony Orchestra, the San Francisco Symphony, Academy of St. Martin-in-the-Fields, the Berlin Philharmonic and the St. Petersburg Philharmonic. Frank performed regularly with the Zurich Tonhalle Orchestra, recording the complete Mozart Violin Concertos with them and David Zinman and has also recorded a Schubert album and the Beethoven sonata cycle, both with her father Claude Frank. She is a sought-after chamber musician and has performed at many international festivals including Aldeburgh, Verbier, Edinburgh, Salzburg, Tanglewood, Marlboro and Ravinia. Aside from her devotion to works of the standard repertory, Frank has performed and recorded a number of contemporary works. Her accomplishments were recognized in 1999 with the prestigious Avery Fisher Prize. She is professor of violin at the Curtis Institute of Music and teaches and coaches annually at the Tanglewood, Ravinia and Verbier Festivals. Since 2008, she has been the artistic director of the Evnin Rising Stars, a mentoring program for young artists at Caramoor Center for the Arts. As an adjunct professor and visiting artist at USC Thornton, she will teach a studio of graduate students during the 2018-2019 school year while continuing her primary position at the Curtis Institute.